Making T-shirt yarn is a fun option to repurpose T-shirts you might have stopped wearing because of stains, sizing issues, or not liking them anymore. The yarn can be used for a variety of home decor and other projects, including bags, rugs, bathmats, and coasters. Shirts that don't have side seams make the smoothest yarn, and you'll also want to skip the parts of shirts that have logos on them. To get started you'll need some old-but-clean T-shirts and a good, sharp pair of fabric scissors. The grid is by no means necessary, but it helps to protect the table top. Begin by laying the shirt out flat and cutting off the bottom seam and the top below any logo. If there's no graphic on the front of the shirt, cut it just below the ​armholes. There are several different ways to cut a shirt to make T-shirt yarn, but this is one of the fastest methods. Leave the shirt in two layers as if you were getting ready to fold it, with the closed edges at the top and bottom of your cutting surface and the open edges on the sides. Cut the T-shirt into strips the width of your choice. The project in the photo uses about one-inch wide strips but you can make them slightly narrower or wider to fit your preference. Avoid going narrower than half an inch, though, or the yarn can become less stable. The key point about this step is not to cut all the way across the T-shirt; leave about an inch at the top along the closed edge uncut. When the cutting is done you'll have something that looks like a hula skirt, but with the top edge closed. It takes a few more cuts to make this cut-up T-shirt look more like yarn. Open the shirt up so you're looking at the uncut space between the cut slits. To start your thread formation, looking at the bottom-most join between two slits, cut from the top of the bottom slit to the top of the next slit. This will make a V-shaped piece, as in the picture. Now that you've gotten started, continue cutting the uncut part of the loops, but this time you'll cut straight across rather than on the diagonal. Cut across each strip in the same manner until you've reached the end of the loops. When you get to the end of the T-shirt, you'll have something that looks a little like the T-shirt yarn in the picture, with one loop left and a triangular or rectangular piece connecting the loop. Simply snip that piece and the loop will straighten out, giving you one long piece of T-shirt yarn cut continuously from your shirt. You can leave the end of the yarn slanted if you don't care about perfection (and this is not a project about perfection) or you can trim it square, whatever you prefer. If at any point you make a wrong cut and end up with a couple of different pieces of yarn from the same shirt, don't worry. It's still totally usable even if it's in shorter lengths. 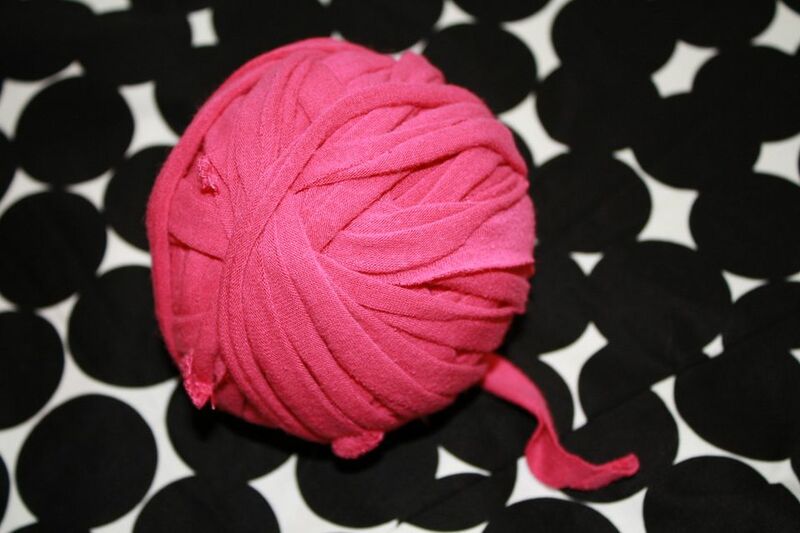 Now that your T-shirt yarn is all cut out, it's simply a matter of rolling the yarn into a ball and you can use it just as you would any other yarn. Before you start rolling, though, you'll probably want to encourage the yarn to roll up on itself, leaving fewer of the raw edges exposed. To do that, take the yarn by the length and give it a hard tug between your hands. You can also roll it a bit between your fingers as you go to help the raw edges roll to the inside. Even after doing this the edges might not be completely perfect, but that's part of the fun.